Mass monster? Nah...you'd rather be proportional and ripped, right? Here are the top 10 nutritional strategies you need to ensure you're on track to a lean, muscular physique. Anyone can eat enough to get big. But if you want to add the kind of size that looks right when you're strolling down the boardwalk by the Muscle Beach Gym in Venice—where some of the greatest bodybuilders of all time have looked their best—then just "big" won't cut it. The greats of yesteryear knew it was possible to grow from scrawny to huge in a way that builds symmetrical, streamlined muscle and gives you a dense, lean look from your traps to your calves. They knew that with patience and the right plan, you can have the size, and the abs, too. To get some new insight into proper weight gain, I talked with a nutritionist and several Muscle Beach-sponsored athletes to assemble these 10 smart, practical nutritional tactics for the aspiring bodybuilder who wants to look good, not just big. Are you putting on the wrong kind of weight when you want to be losing it instead? Or maybe you're stuck in neutral? Either way, the problem may be that your calories in versus calories out balance is out of whack. To get on the right track, multiply your body weight by 16-18 to get your ideal growth range. According to this formula, a 160-pound guy should be taking in 2,560-2,880 calories per day (160 pounds multiplied by 16 and then by 18). For best results, those calories should be spread among 5-7 meals, one every 2-4 hours. If you need to drop a few pounds, multiply your body weight by 12. If maintenance is the aim, you'll want to fall within the 13-15 range. When you plan the meals to hit these numbers, keep in mind that not all calories are created equal. If they were, we could all live on ice cream and Ho Hos while we sculpt our bodies. In reality, you hit those numbers by taking a hammer and chisel to your diet to trim away the junk. Replace empty calories with a proper ratio of 30 percent protein (see number 3 below), 50-60 percent carbs (mainly whole grains, fruits and vegetables, as explained in number 5), and 10-20 percent high-quality fats (see number 6). Yeah, you really can gain or lose too much weight too fast. If you're gaining more than 2-3 pounds a week, it's probably mostly body fat. If you're dropping more than 2-3 pounds a week, it's probably a lot of muscle tissue. If, after three weeks, you're not moving toward your target at a steady pace, adjust your calorie level up or down by 200-400 calories per day. Maintain your current macronutrient ratios, and stick with that new level for another three weeks. Keep tweaking your macros until the scale is moving steadily in the right direction. Developing a jaw-dropping, well-balanced physique comes down to protein or, more specifically, to the amino acids found in complete proteins such as meat, fish, and dairy. For protein I eat a lot of fish, mostly tuna, eggs, milk, chicken, sometimes red meat, oats, nuts seeds and kernels," says Muscle Beach-sponsored athlete Ike Catcher. "Lean meats are one of your body's greatest fat-burning sources, helping to jump-start your metabolism and build healthy muscle tissue while helping you feel full and satiated," says Tiffani Bachus, RD., co-author of "No Excuses! 50 Healthy Ways to Rock Breakfast." "Approximately 15-20 percent of your daily calories should come from lean protein such as chicken and turkey breast, fish, lean cuts of beef including loin and round cuts, and egg whites. If you're having trouble squeezing enough of those filling foods in your meals, make protein shakes your secret weapon. Add a 20-25-gram protein shake to your meal plan once or twice a day to hit your numbers without feeling stuffed. 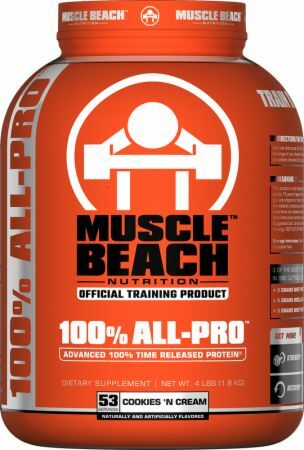 Muscle Beach Nutrition's 100% All-Pro will do the trick. If you’ve never tried to train hard and add significant amounts of muscle, "carbs" has maybe become a dirty word to you. That's a mistake. If you train intensely, you need carbs—and lots of them. Following a low-carb diet for too long can leave you feeling depleted and potentially catabolic, shedding muscle mass instead of body fat. Of course, carbohydrates cover a wide range of foods, and not all of them are bodybuilding-friendly. "Vegetables are a great source of carbs," says Bachus. "They're nutrient rich and high in fiber so it takes your body longer to break down, absorb, and digest them, which helps you feel full for longer. Plus, antioxidants found in many vegetables support good health and disease prevention." Carbs can be split into two basic categories: simple and complex. Simple carbs include foods such as candy, fruit juice, cereals, pasta, cakes, cookies, and white bread. Your body can break down these kinds of carbs quickly, but that can cause your blood sugar levels to spike, leaving you feeling shaky, dizzy, and drained after the subsequent crash. For the most part, you'll want to limit the amount of simple carbs you consume—except for right after your workout (see number 7). Instead, choose complex carbs that break down more slowly in the body, giving you more sustained energy and avoiding those spikes in your blood sugar level. “My go-to sources for complex carbs are sprouted Ezekiel bread in the morning and sweet potatoes with my evening meals,” says Gavin McHale, a Muscle Beach Nutrition-sponsored athlete. Like carbs, fat comes in a couple varieties. The bad-for-you fats include saturated or trans fats like those found in butter, cheese, ice cream, and marbled red meat. Good-for-you fats contain monounsaturated and polyunsaturated fat, which includes the essential fatty acids omega-3 and omega-6. These fats are healthier and can even reduce your risk of disease and inflammation, a welcome benefit for those who train hard. Good sources for good fats include fish, seeds and nuts, and oils such as olive, canola, sunflower, and corn. If you're serious about transforming your body, you have to get your nutrition right. Period. Before you hit the gym, set the stage for success by consuming an array of nutrients, including L-citrulline, arginine, beta-alanine, and creatine, all of which can to enhance growth, strength, and endurance. The best pre-workout products deliver a mix of these. After your workout, immediately consume 20-30 grams of whey protein, along with amino acids and a fast-acting carb. Post-workout is the one time of day when sugar or candy is not such a bad thing, because the carbs in them help deliver protein to your recovering muscle tissue. Like carbohydrates, sodium has gotten a bad rap for years. The line of thinking has been that consuming too much sodium causes the body to retain too much water, which can lead to increased blood pressure, a risk factor for heart disease, stroke, and kidney disease. Some bodybuilders have even gone on super-low-sodium diets thinking they were avoiding the kind of water-swollen physiques that don’t do well at shows. Several studies have shown that consuming less sodium can lower your blood pressure, but not by much at all. [1,2,3] The fact is, it's important to get enough sodium in your diet. The best nutritional approach is to be aware of your sodium intake and aim for levels that are neither too high nor too low, which can sometimes be tricky. "The problem is that sodium is often hidden in foods advertised as low-fat or non-fat," Bachus says. These foods also tend to be highly processed. Check your labels and stick with lean, clean unprocessed foods like green vegetables, fresh meats, and unprocessed grains whenever possible. Avoid canned foods, soups, and frozen entrees, which tend to be high in sodium content. Dehydration is a more common problem than you might realize, and one that can directly influence the way your body looks. A dehydration level of just 1-2 percent of body weight can compromise your work capacity and exercise performance, really screwing up your workouts and leaving your muscles looking flat. Symptoms of severe dehydration are pretty obvious: muscle cramps, lightheadedness, and heart palpitations. Signs of minor dehydration, however, can be harder to spot. To reduce the risk, maintain a steady fluid intake all day long and keep an eye out for darker-than-normal urine, which can signal dehydration. If you use thirst as a signal that you need to drink more fluids, you've probably waited too long. You may have heard that any liquid, even caffeinated beverages, can help meet your body's hydration needs. That's true to an extent, but your best bet is to drink good old pure water, free from calories, coloring, and additives. "To arrive at a rough idea of the amount of water you should drink every day, divide your weight in half. That's about how many ounces of water you should consume each day," Bachus says. "If you weigh 180 pounds, consume approximately 90 ounces, or a little more than 11 cups, of water a day. Don't worry about drinking too much water. Your body will just flush the excess, along with excess sodium." Alcohol is counterproductive when improved aesthetics is your goal. In fact, it does a kind of "double whammy" to your body, not only reducing your body's fat-burning ability, but actually increasing your fat storage. So, if you’re one of those people who likes to celebrate a massive workout with a bottle of beer, it's time to drop that little luxury. "Your body converts the majority of the alcohol you consume into energy to fuel your body," Bachus explains. That may sound like good news, but it means your body is burning alcohol instead of stored body fat. Worse still, any alcohol your body doesn't burn ends up being stored as fat. " And then there is the hard truth that if you've had too much to drink, your better judgment may crawl into the back seat as you pass that all-night diner on the way home. If you really want that sculpted body you dream about, keep your eyes on the road ahead and drive on by those seven-egg cheese omelets and cinnamon rolls. Like what you read? Then you should check out the Muscle Beach Nutrition WIN BIG! GET BIG! Giveaway for a chance to win more than $10,000 in prizes! Taylor, R. S., Ashton, K. E., Moxham, T., Hooper, L., & Ebrahim, S. (2011). Reduced dietary salt for the prevention of cardiovascular disease. Cochrane Database of Systematic Reviews, 7(7). Stolarz-Skrzypek, K., Kuznetsova, T., Thijs, L., Tikhonoff, V., Seidlerová, J., Richart, T., ... & European Project on Genes in Hypertension (EPOGH) Investigators. (2011). Fatal and nonfatal outcomes, incidence of hypertension, and blood pressure changes in relation to urinary sodium excretion. Jama,305(17), 1777-1785. Alderman, M. H., Cohen, H., & Madhavan, S. (1998). Dietary sodium intake and mortality: the National Health and Nutrition Examination Survey (NHANES I). The Lancet, 351(9105), 781-785.